World of Tanks VR has you using your head to turn your turret and orient your tank, and the controllers to move back and forth. As of now World of Tanks VR is still at a relatively early stage in its development and offers only a few tanks. VR has been one of the most exciting technologies for casual gamers in recent years. Jump into your favourite game worlds for a different kind of experience. Unfortunately, due to the strain VR usually puts on most gamers, it’s hard to enjoy it for long durations but that hasn’t stopped developers from upping the ante by creating more immersive big budget VR experiences. At Gamescom 2018 the biggest names in the gaming world were showing off some amazing tech and one particular experience caught my eye. Wargaming is popular around the world for their amazing World of Warships game and of course the ever popular World of Tanks. The VR experience currently in development by Wargaming and Neurogaming puts gamers quite literally in the driving seat of their favourite tanks! Speaking to Kanstantsin Netyliou, Product Manager for World of Tanks VR he said the idea behind World of Tanks VR was to make it accessible to gamers so it used only Standard VR equipment in the form of the HTC VIVE. The current demo that was playable at Gamescom was running on top of the line GeForce GTX 1080Ti GPU’s. Essentially, World of Tanks VR has you using your head to turn your turret and orient your tank, and the controllers to move back and forth. It’s quite exciting really to be sitting on top of your tank in the gunner's seat and operating that awesome piece of machinery! Getting used to the control takes a little while, and might leave a few people a little disoriented for a few minutes, however, once you get a hang of things it’s quite fun! The game can support up to 4 players right now, in a relatively small map when compared to the full game. The small size of the map is to ensure the 4 players don’t spend too much time looking for other, but at the same time, the map has enough variations in terms of landscape and multiple paths to make it an exciting experience almost every time. As I mentioned fatigue and nausea are two factors that hold VR from taking a leap to the next level, World of Tanks VR in all its playtests with VR gamers and new gamers showed discomfort for less than 3 per cent of the players which goes to show that developers really are trying to make VR games more viable for longer sessions. 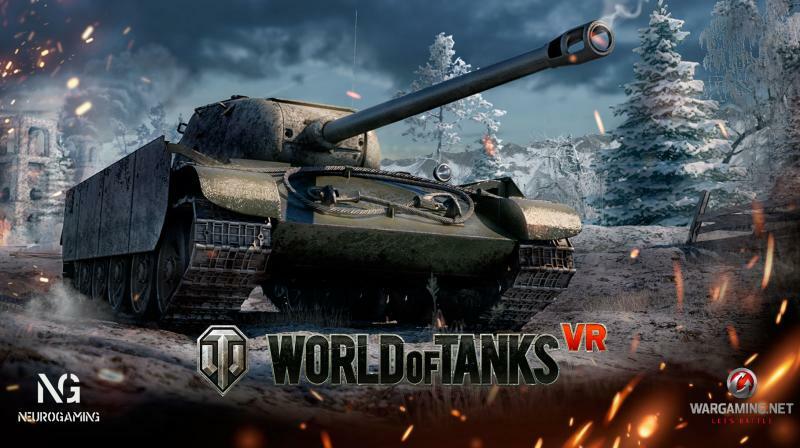 As of now World of Tanks VR is still at a relatively early stage in its development and offers only a few tanks, but the gameplay mechanics seem to be a spot in. Wargaming plans to, of course, add more maps and tanks to the game, but it will most likely not come close to the few hundred tanks available in the full PC game.